How to crochet an easy cardigan for newborns with raglan sleeves! Row 1: 1hdc into the 2nd chain from hook, 1hdc in each of next 4, (1hdc,chain1, 1hdc) into the next, 1hdc in each of next 4, (1hdc,chain1, 1hdc) into the next, 1hdc in each of next 18 chain, (1hdc,chain1, 1hdc) into the next, 1hdc in each of next 4, (1hdc,chain1, 1hdc) into the next, 1hdc in each of last 5. Row 8: chain 1, turn, 1hdc in each stitch across until the next chain-space, 1hdc into the chain-space, skip all next stitches, 1hdc into the next chain-space, 1hdc in each stitch across until the next chain-space, 1hdc into the chain-space, skip all next stitches, 1hdc into the next chain-space, 1hdc in each of last stitches. Row 9: chain1, turn, 1hdc in each stitch across. 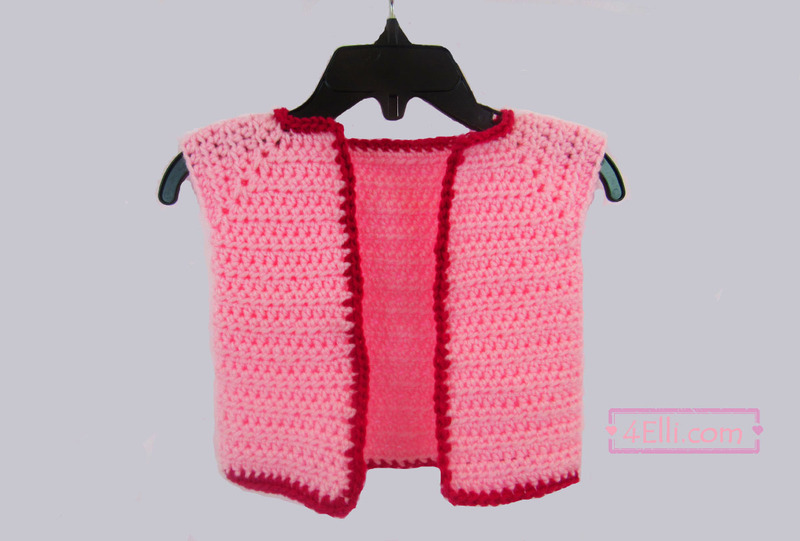 In the end change to dark pink and make 1 sc in each stitch around the cardigan. In the end slip stitch to the 1st, cut the yarn and finish your work. Watch my video tutorial witch shows you how to crochet this easy cardigan for newborns step by step!